Wisdom of Life. 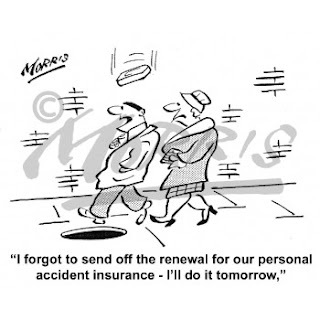 : Personal Accidental Insurance is good for you. Dr Lee had been paying his Personal Accident Insurance premium for many years, covering his life for One Million. On expiring recently he refused to renew, giving reasons as he seldom travel outside. Being a medical doctor who has his clinical practice, his exposure to accident is nil... That was what he claimed. Not to argue much with a defensive client I had to agree with him. Anyway I suggested some interesting suggestion to him. I said.. Why not let me pay this premium of one thousand ringgit for you instead. On renewal every year I will also continue to pay. Dr was amazed! Promptly he wanted to know the reason behind. My proposal to him... If you agree, then please assign this PA insurance to my name. By assigning to me, I will have the full right over the benefits. In the event if an accidental death happen to you, the one million goes to me. Or if by accident, either one eye goes blind, or either one limb or one arm broke, or for any reason total disability occurred, the same one million will be claimable by my good self. Well! Since you don't need this PA any longer and the premium is considered cheap cause of the promotional sales given, why not let me benefit this cover then. I looked at his eyes without saying further. Took him awhile to respond to this suggestion. He said "Sorry Robert, I think I want to continue the PA". Moral of the story: Facing fear he could not take chances. Most people are selfish and are unwilling to let other benefit. are you mean it?? or is that a trick?? i'm just amazed... wow you are a walking encyclopedia..
i'm gamiya(ගැමියා) my actual name is "thilina shmaika wijethunga"
I still prefer to call you Gamiya coz its easier to remember. That name sounds great to me too. What I wrote are truly from my heart. I could think fast and reply instantly because I use the left and right mind at the same time. Left mind is the logical brain and the right is the creative one. Most people only use the left. I had also written on this subject before on my blog. At the same time, I have a third eye which can see in depth. It takes years of experience in life to acquire it. Good! Create another Blog of yours in English and I'm sure you can contribute your thoughts there. Btw... What profession are you in currently? Life is a journey, take it as a challenge and enjoy riding on it. Learn from your mistakes and know your strength. Good luck to you my friend.